Calling all Pool Lovers to this Backyard Outdoor Oasis! Must stop and check this one out! Incredible, updated, sprawling ranch in Normal. Serious remodel in 2010 – New doors, trim, crown molding, some new Anderson Windows, 3M window tint, patio french doors, floors, kitchen island with seating, Cambria quartz countertops, appliances, warming drawer, under counter fridge, under cabinet lighting, light fixtures, both bathrooms tile, tile tub surround, vanity, toilet and fixtures. 2011 Basement Remodel – egress windows with wood window wells, doors, trim, crown molding, floors, ceiling, custom built bar with wet sink, quartz CT, custom fireplace surround and cabinets, lights, surround sound, and more. 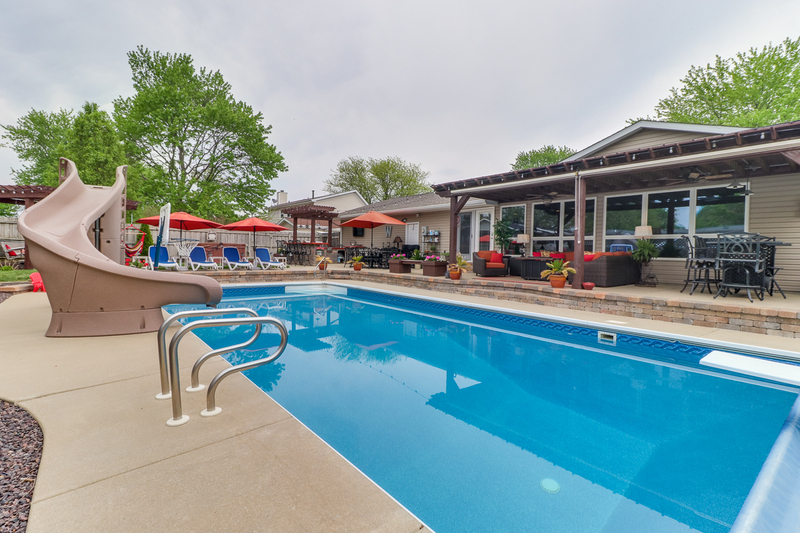 Backyard oasis features outdoor kitchen w/ concrete CT, outdoor living area, two bar areas, in-ground saltwater pool, firepit w/ rubber mulch and cedar pergola! New 50 Year Roof in 2013 w/ new gutters. Come look to see the rest!! Other Notes: House is a smart home with door sensors, control for door locks, whole house fan, garage door, and thermostat. Devices can be controlled by phone app, Amazon Echo, or Google Home. Some of these items can be removed if not wanted. House is protected by Sentricon Termite System. Radon Mitigation system installed.